Definition at line 76 of file clientStream.h. Definition at line 86 of file clientStream.cc. Referenced by clientStreamInit(), and clientStreamInsertHead(). Definition at line 95 of file clientStream.cc. References data, debugs, NULL, and removeFromStream(). Definition at line 285 of file clientStream.cc. Referenced by clientStreamCallback(), esiStreamRead(), and ESIContext::send(). Definition at line 78 of file clientStream.h. Definition at line 276 of file clientStream.cc. Referenced by clientStreamDetach(), clientStreamRead(), and clientStreamStatus(). Definition at line 267 of file clientStream.cc. References dlinkDelete(), head, and NULL. Referenced by clientStreamDetach(), and ~clientStreamNode(). Definition at line 91 of file clientStream.h. Definition at line 94 of file clientStream.h. 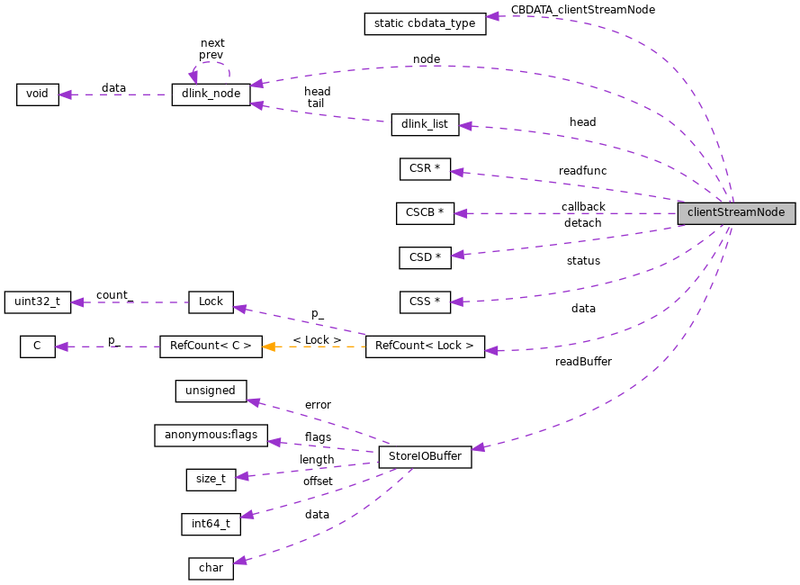 Referenced by ConnStateData::abortChunkedRequestBody(), clientGetMoreData(), clientProcessRequest(), clientReplyStatus(), clientSocketDetach(), clientSocketRecipient(), clientStreamCallback(), clientStreamDetach(), constructHelperQuery(), ClientHttpRequest::doCallouts(), downloaderRecipient(), Ftp::Server::earlyError(), esiBufferRecipient(), esiProcessStream(), esiStreamDetach(), esiStreamRead(), esiStreamStatus(), ClientHttpRequest::handleAdaptationFailure(), ClientHttpRequest::handleAdaptedHeader(), Downloader::handleReply(), Http::One::Server::processParsedRequest(), clientReplyContext::sendClientOldEntry(), ConnStateData::serveDelayedError(), Ftp::Server::setReply(), Http::One::Server::setReplyError(), clientReplyContext::triggerInitialStoreRead(), and ~clientStreamNode(). Definition at line 92 of file clientStream.h. Definition at line 89 of file clientStream.h. Referenced by clientStreamAbort(), clientStreamInit(), clientStreamInsertHead(), and removeFromStream(). Definition at line 88 of file clientStream.h. Referenced by clientGetMoreData(), clientSocketDetach(), clientSocketRecipient(), clientStreamCallback(), clientStreamDetach(), clientStreamInit(), clientStreamInsertHead(), clientStreamStatus(), downloaderRecipient(), esiBufferRecipient(), esiProcessStream(), esiStreamRead(), esiStreamStatus(), clientReplyContext::getNextNode(), and clientReplyContext::traceReply(). Definition at line 95 of file clientStream.h. Referenced by clientGetMoreData(), clientInterpretRequestHeaders(), clientStreamInit(), clientStreamInsertHead(), clientStreamRead(), constructHelperQuery(), ClientHttpRequest::doCallouts(), clientReplyContext::doGetMoreData(), esiBufferRecipient(), esiProcessStream(), esiStreamRead(), ClientHttpRequest::httpStart(), clientReplyContext::processReplyAccessResult(), clientReplyContext::purgeFoundObject(), ESIContext::send(), clientReplyContext::sendMoreData(), and clientReplyContext::traceReply(). Definition at line 90 of file clientStream.h. Definition at line 93 of file clientStream.h.